Literary agent Libby Holmes only wants two things in life: to be slim and to have her boyfriend Toby propose to her. When neither of these appear to be going her way, she allows herself to be sent abroad to Cambodia to accompany one of her company’s up-and-coming hotshot authors on a book tour. Ex-SAS officer (and author) Alex Bryant is everything you’d want in a hero: tall, dark, and smoldering. Libby is cheered on by her best friend Issy towards adventure and romance (while being held back by her boyfriend Toby, the obvious villain of the novel). When a series of Bridget Jones-esque events come to pass, Libby ends up going completely off the radar with Alex, with nothing but time to consider her options. With Toby, Issy, and Libby’s parents flying out to her rescue, hilarity ensues, but underneath it all, Libby can’t help but wonder: is her tried-and-true Toby really the man of her dreams? Is this all that life has to offer, or is it time for Libby to finally take a chance and break free of the expected? Coconuts and Wonderbras was a cute, fun read from Lynda Renham. It was light and easy to pick up any time. I did find Libby’s obsession with her weight to be a little grating, and found myself wishing at times she could see herself on a deeper level than what she had eaten or how much she weighed. She’s also a bit of an airhead, but when we meet her mother we can chalk that up to genetics (her mother has an alarming habit of referring to her Blackberry as a "blueberry"…). Overall, it’s an effortless read, mainly due to the fact that the characters aren’t that complex. Libby is the quintessential Bridget Jones-y, Shopaholic-type heroine. Alex is the obvious masculine, handsome hero. Toby is the perfect foil to Alex, and is painted so not only in his mannerisms, but also in his appearance. Issy is a great friend…bouncy and fun and up for anything. I enjoyed how some of the chapters were written from Issy’s point of view, and some from Alex’s. I wish these had been notated a bit better, as I found myself reading a page, figuring out who was talking, and then having to go back and re-read it, but these glimpses into other minds and viewpoints were invaluable in moving the storyline ahead and letting the reader see the situation from new eyes. I especially enjoyed the chapters written from Alex’s point of view, as they were a welcome break from the fluffy, girlish chapters. Overall, I really enjoyed the character development that we saw in Libby, as well. She seemed to grow from a one-dimensional cardboard girl who was only worried about her weight and getting a ring on her finger, into a woman who became aware that she was the creator of her own destiny. 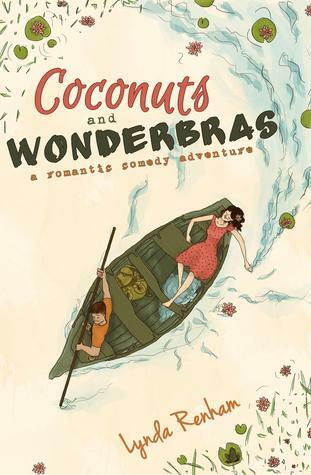 If you’re looking for a light read, I’d definitely recommend Coconuts and Wonderbras by Lynda Renham. For less than $3 on Kindle, this fun romp that travels from the streets of London to the jungles of Cambodia is a steal! Thanks to Raucous Publishing for the book in exchange for an honest review. The title of this book definitely caught my eye! Sounds like there are some fun characters in this one.